We have a situation in the United States and NATO, along with the belligerent State of Israel, where the ruling elite believe that it is ultimately possible to win a nuclear war. Think about that "To win a nuclear war". Anyone with half a brain should consider this, and ask themselves the question of how is it possible to win a nuclear war? Maybe, and this is a very small maybe, if just one or two nuclear weapons could subdue Iran, well maybe the it would be possible to "win" a nuclear war. The facts just don't support this however. One or two nuclear devices would not put a dent in the conventional capability of Iran. Iran is a nation that has the power to mobilize almost three million soldiers. Think about the fact that Afghanistan is beating the U.S. and NATO Forces with only 24,000 Taliban fighters. What makes the civilian and military leaders of NATO believe that we could take an Army, fighting for its homeland, which is millions strong? The "conventional wisdom" is that we would of course use nuclear weapons. The powers that be don't take into account that recent studies in which two "minor" nuclear states using nuclear weapons against each other would cause a nuclear winter that would last from 8-10 years. The Earth without sunlight for that period of time would cause an extinction of most life on Earth, including the human race. We have nuclear weapons in the direct command and control of "regional field commanders". What does that mean exactly? What is a "tactical nuclear weapon" anyway? When I was in the Army I worked on a Nike-Hercules surface to air missile site and we also had "tactical nuclear warheads" in our inventory. While they were called "tactical" they had the destructive power of the bombs used on Hiroshima and Nagasaki. Somehow I believe that our government isn't being exactly forthright with the American people. It is my opinion, after being around nukes for over a decade, that there is no such thing as a "tactical" nuclear weapon. The term "tactical" may be correct in the assumption that it is a tactic to destroy the enemy, but at what cost, a "nuclear winter" that would destroy most life on Earth including our entire human race? Is winning a war so important that we should kill everyone in the process? Our government has been talking about "limited nuclear war" for so long now that I believe that they have fallen for their own rhetoric. Who will guarantee that "just enough" nukes will rain down on Iran and win this "all-important war" that could sacrifice the human race? Who will guarantee that all the Russian and Chinese engineers that will be vaporized at the nuclear reactors in Iran won't cause the Russians' and Chinese to retaliate with "tactical nuclear devices" of their own? 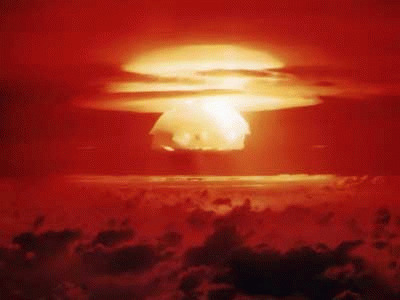 Does Obama know for sure what the results of a nuclear attack on Iran will be? Maybe he thinks he does, but we on this planet have seen many leaders act on what they believed were "actionable intelligence". Hitler believed that he could invade Russia and take it in a year. How did that work out for him? Even if we believed we could take out Iran with "conventional forces", how long would it be before millions of well-trained and motivated Iranian soldiers poured over the Iraqi border and attacked our military bases in Iraq? What would our response be? My bet would that we would go into the much-touted "toolbox" and use our "tactical nuclear weapons" on them. Then we could see the Middle East turn into a radiological wasteland if we didn't trigger that "nuclear winter" everyone has been warning us about (oh, except those in our government and military).